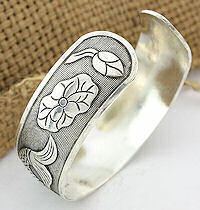 This silver overlay cuff bracelet is intricately carved with fish and flowers. This silver fashion cuff bracelet is .75" wide (1.905cm) and 2.5" (6.35cm) across the longest side. It can be adjusted to fit most women's wrists by gently squeezing or pulling the sides in or out. This product was added to our catalog on 06/10/2012.